SEEK2019 might be best known for its massive gatherings. 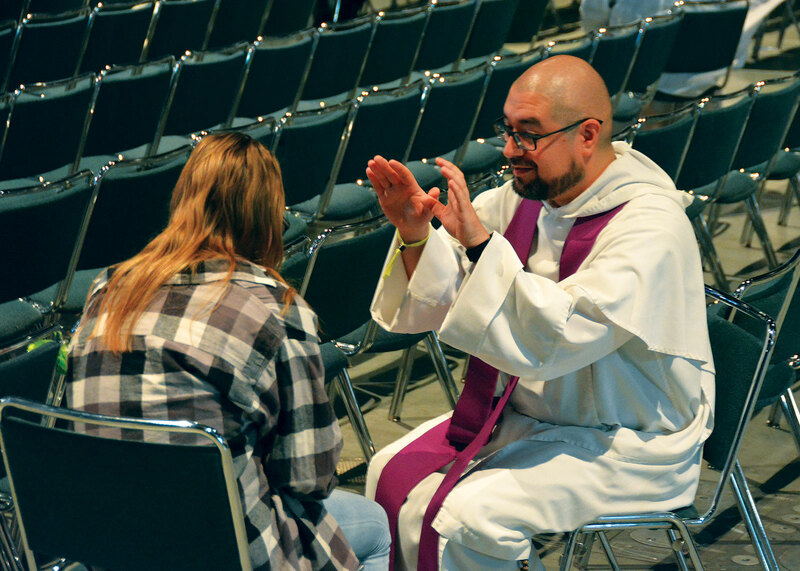 More than 17,000 people from across the nation, most of them Catholic college students, filled a quarter-mile long cavernous hall in the Indiana Convention Center in Indianapolis to worship together at Mass, listen to keynote speakers and adore the Blessed Sacrament. But as the biennial conference sponsored by the Denver-based Fellowship of Catholic University Students concluded on Jan. 7 and all the attendees made their way from Indianapolis back to their homes, many of them went away with a powerful memory of a more intimate encounter in the sacrament of penance that might just change their lives. Conference attendee Timothy Flax reflected on his experience of confession moments after he had received God’s mercy in it on Jan. 4. Emily Angelotti, a junior at the University of Virginia in Charlottesville, Va., who attended SEEK, agreed. Father John Fletcher, a priest of the Archdiocese of Detroit, was one of many priests leading penitents in the sacrament of penance at the conference where Flax, Angelotti and a long line of others went to confession. Having 25 priests hearing confessions for several hours was how the sacrament was offered on most days at SEEK. But things changed on the evening of Jan. 5. Waiting in a line that snaked back-and-forth in the convention center much like a line for a roller coaster at an amusement park, thousands of attendees walked for more than a mile as they made their way to a large hall where nearly 500 priests were hearing confessions. At the heart of the room was the incorrupt heart of St. John Vianney, a 19th-century French priest who is the patron saint of parish priests and is famous for spending up to 18 hours each day hearing confessions. One of the priests there was Dominican Father Patrick Hyde, associate pastor of St. Paul Catholic Center in Bloomington, who heard confessions for several hours over the course of the conference. “To see his heart, to pray in its presence, was a visceral reminder of the absolute necessity of having a generous, gentle, loving and priestly heart,” Father Patrick said. Guadalupe “Trey” Rodriguez, a student at Tarleton State University in Stephenville, Texas, was one of the conference participants who happily stood in line on the evening of Jan. 5 for the sacrament of penance. Having the chance to share God’s mercy at SEEK with young people like Rodriguez encourages Father Patrick in the campus ministry he helps lead at Indiana University and for the broader Church.